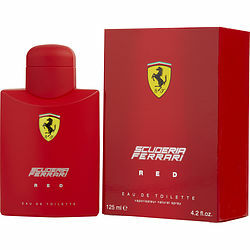 Indulge in the richness of citruses with this clean and vibrant scent by Ferrari. Released in 2010, Ferrari Scuderia Red exudes an air of masculinity and sophistication that is bound to make you feel confident all day long. An excellent scent for daytime wear, this men's fragrance is enriched with notes of bergamot, mint, orange, lemon verbena and petitgrain. Spray on yourself before you leave the house and leave a trail of aromatic citrusy aroma anywhere you go.